In March people do more than go to work and watch the calendar countdown to Easter in April, they buy comics too. With Marvel retaining the spot of publisher #1 in the March sale stats by a unit share lead of almost 10% over DC, Image Comics was left to continue its renaissance, achieving 11% - a rarity for a non-Big Two publisher. 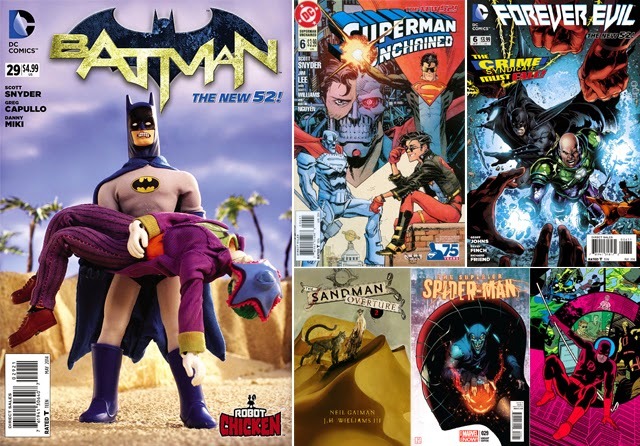 THE TOP 6 COMICS FOR FEBRUARY 2014: 1) BATMAN #29 2) Superman Unchained #6 3) Forever Evil #6 4) Sandman Overture #2 5) Superior Spider-Man #29 6) Daredevil #1 - Full stats after the jump. MY THOUGHTS: It's official - if Sean Gordon Murphy's above variant cover to Superman Unchained was a person, I'd marry it. I miss 90's Superman comics where the emphasis was on fun adventures like Reign of The Superman, Blue Superman and more. Had Marvel pushed that Peter Parker returns in Superior Spider-Man #30, that might've pushed it and the issue prior higher (rather than spots 5 and 7). Nice to know, some surprises are left for the page though. THE LITTLE ENGINE THAT COULD: Alan Moore may be comics most controversial 'celebrity', but he still knows how to move comics. Top Shelf Productions stole third place on the Graphic Novel top sellers list, with Moore's League of Extraordinary Gentlemen spin-off Nemo: Roses of Berlin. Top stuff. TOP COMICS OF MARCHS PAST: Stephen King coming to Marvel topped the list in 2008 with Dark Tower: The Long Road Home #1. That blue Kal-El I spoke of earlier did the same thing in 1997 with Superman #123, and the death of Steve Rogers rocked the world all the way to the bank with Captain America #25 in 2007.